This is a great easy appetizer that can be served any time of year. If you are pressed for time, you can buy already-made pesto sauce. Makes approximately 40 appetizers. If you are really pressed for time, you do not necessarily have to toast the bread. Although...toasting the bread gives the appetizer a nice little crunch. If you have more time, you can make a balsamic reduction instead of a vinaigrette. This way there will be no separation of liquids. A reduction is also packed with flavor. Use sparingly though because the pesto is also flavor-packed. Drop garlic into the feed tube of a food processor while running. Run until garlic is minced. Add walnuts to the bowl and pulse until coarsely chopped, about 5 times. Add the basil leaves, salt, and pepper and process for about 10 seconds then scrape down sides. Process for another 10 seconds. With the processor running, slowly pour the olive oil through the feed tube and process until the pesto is thoroughly blended. Scrape the pesto sauce into a small bowl and mix in the Parmesan cheese. Preheat oven to 400 degrees. Cut the Italian bread into small squares about 1 1/4 x 1 1/4 inches (not too thick). Brush both sides with some olive oil and place on a baking sheet. Bake until underside of bread is golden brown (approx. 4 minutes). Turn over and bake an additional 2-3 minutes. Keep checking so as not to burn. You only want to toast each side to a golden brown. It is ok if the middle is still a little soft. It will be easier for the skewer to penetrate. Mix olive oil, balsamic vinegar, and salt until emulsified. Spread a little pesto sauce onto each crouton. Then press the end of the cherry tomato through the skewer. Then press the mozzarella through. Then gently press into the crouton. If the crouton is over baked, it will be more difficult (but not impossible) to skewer the bread. 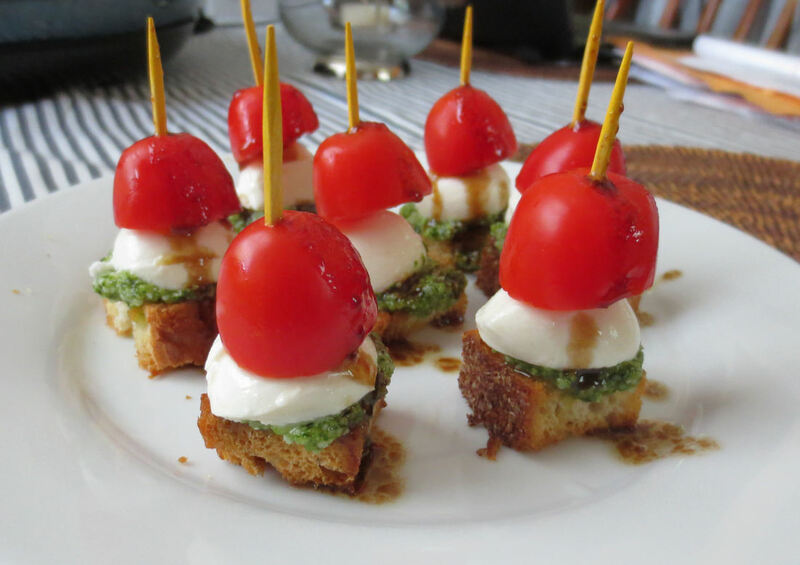 Set each skewer upright and drizzle with the balsamic vinaigrette, Ready to serve!